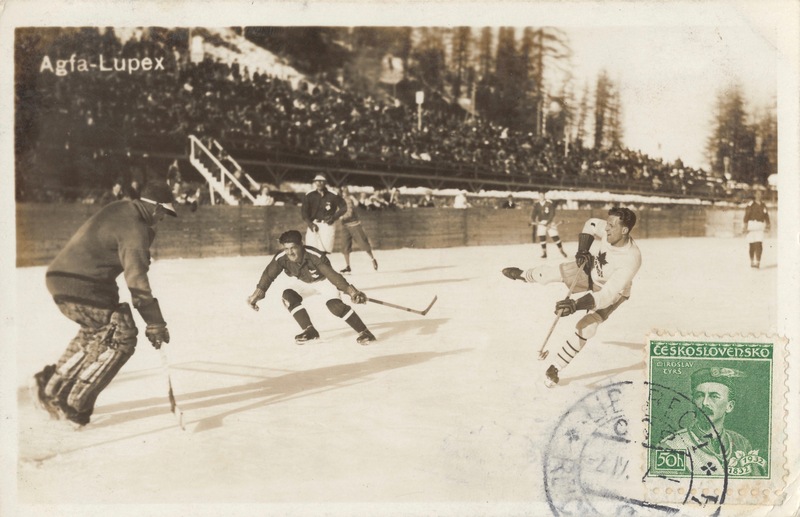 En Route To A Rout: Canada’s 1928 Olympic strolled to a gold medal in St. Moritz with three straight wins, the last of which was a 13-0 lesson to the host team from Switzerland. Here, Swiss goaltender Adolf Martignoni makes a stop (possibly) on Canada’s (I think) beret-free Dave Trottier. 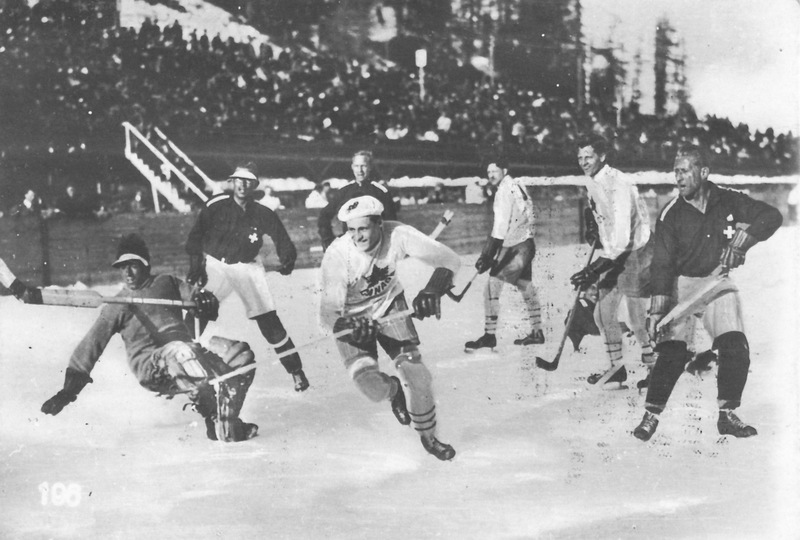 Canada’s hockey team waltzed through the 1928 Winter Olympics in St. Moritz in Switzerland, which is to say barrelled, a.k.a. smoked all comers. They scourged Sweden 11-0 before disdaining Great Britain by 14-0 and sacking the host team 13-0. Depicted here is a scene from that last game in several incarnations. Above is a collectible card issued, post-Olympics, by Erdal, a German shoe-polish company. Charging in with the beret on his head is (as best I can tell) Canadian forward Dave Trottier, a scorer of five goals against the Swiss, who went on to an 11-year NHL career, mostly with Montreal’s Maroons. Tending (i.e. stranded far from) the Swiss goaltender is Adolf Martignoni. 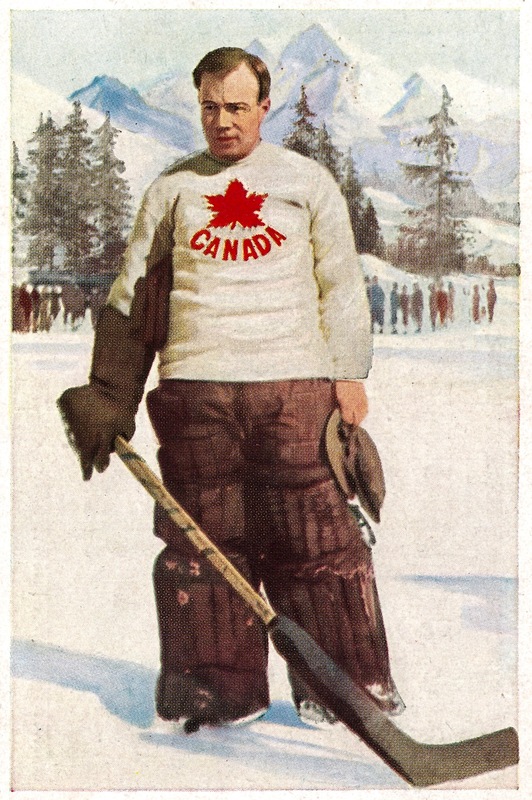 “Canada is the motherland of this game,” the caption on the back reads, in part. “Her team put on wonderful performances.” That’s the same scene below on the card from the German cigarette company Salem, though this time the Swiss stands and their crowd have been excised and replaced by forest. Last, showing the original photograph, is another tobacco-backed card, this one from the Sociedade Industrial dos Tabacos de Angola. 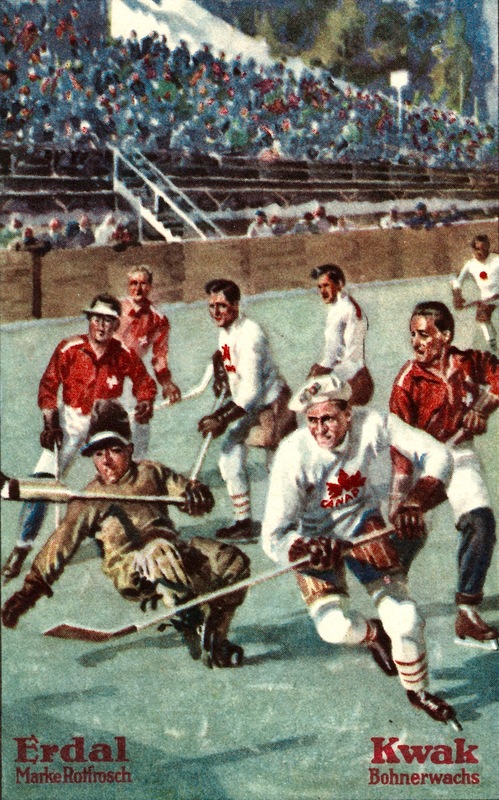 Venturing guesses on the other Canadians, I’d say that the tall trailer might be Hugh Plaxton (he scored five goals in the game) and (farther back) maybe Grant Gordon. 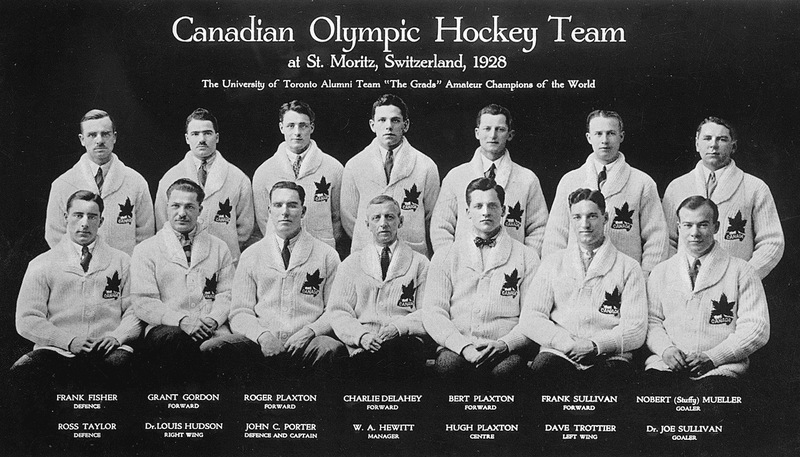 Canada had three moustached members in ’28, two of whom played against the Swiss, which means that it could be Dr. Lou Hudson, too, though it looks more like Gordon. 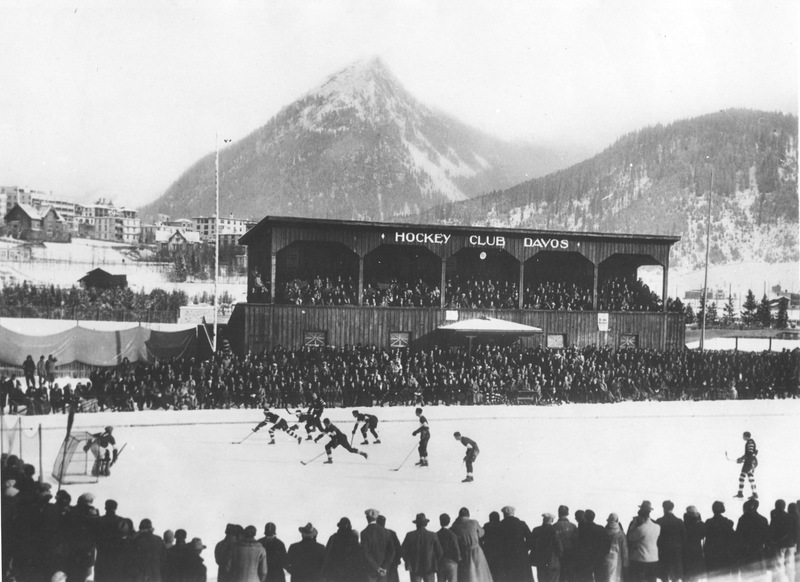 Alpine Ice: The first time St. Moritz in Switzerland hosted a Winter Olympics was in 1928, a year after this portrait of the rink on St. Moritzersee was taken. 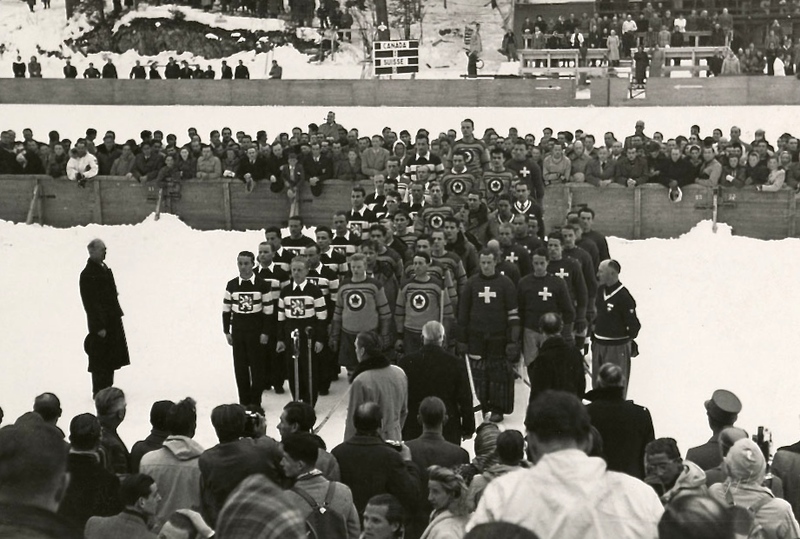 The 1940 edition of the Games was supposed to go to Sapporo, Japan, but in 1938, the IOC re-focussed on a return to St. Moritz. That didn’t last: just a year later, the new (new) plan had the Olympics going back to the site of the ’36 Games, Garmisch-Partenkirchen in Bavaria. Germany’s invasion of Poland later on that year put a stop to that, and in November of ’39, the ’40 Games were cancelled outright. Next up was supposed to be Cortina d’Ampezzo, Italy, in 1944, but with the world still warring, the IOC scrubbed that plan in ’41. 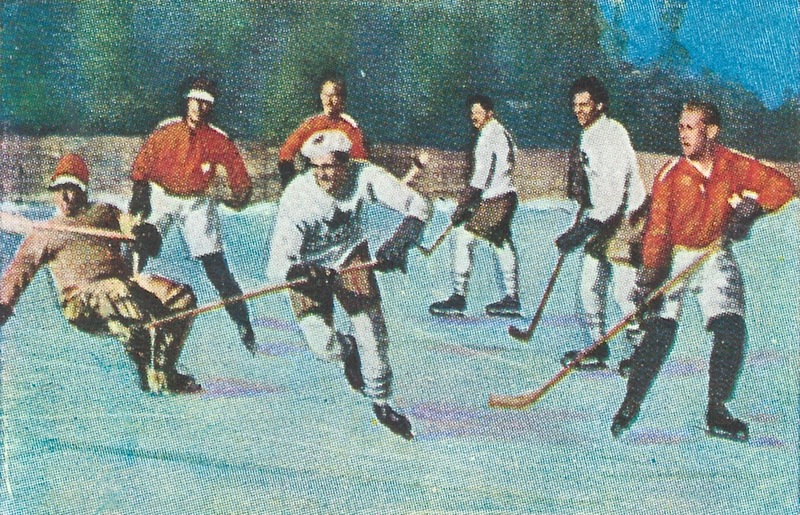 St. Moritz did see its second Games, the first of the post-war, around this time of year in 1948. Hockeywise, that was the year the RCAF Flyers skated out in their effort to restore the natural way of things by winning back the hockey gold that Canada had somehow misplaced in Garmisch in 1936. The snow, if you hadn’t heard, is piling up in Davos in Switzerland this week atop the World Economic Forum, where, as The New York Times has it this morning, “financial titans mingle with heads of state in an annual saturnalia of capitalism.” Prime Minister Justin Trudeau was a keynote speaker yesterday; the President of the United States blows in on Thursday. Amid the heavy weather and the ongoing crisis of the liberal order, can we cast back to this same week in 1932 for a look in on Hockey Club Davos? We can. That’s them here, then, against unknown opposition. The World Economic Forum got going in 1971; HC Davos dates back to 1918. Today, the team has 31 Swiss National League championships to its name, along with 15 Spengler Cups. The annual invitational Spengler is, of course, a Davos institution, going back to 1923. These days it’s played next door to the old Eisstadion Davos pictured here, under magnificent cover at the Vaillant Arena. HC Davos has been at home therein since 1979. This season, they’re standing in fifth place in the 12-team Swiss table, 19 points back of the defending champions from SC Bern. Davos plays next on Saturday, when they’re away to Lausanne HC. The outdoor rink is still there where it was in downtown Davos, with all the snow and the global elites, though minus (too bad) the wooden stand shown above. It wasn’t easy, but they did it: on this day 69 years ago, the RCAF Flyers won gold in St. Moritz at the V Winter Olympics Games. That’s them above, flanked by the silvery Czechs and bronze-winning Swiss. Capping off a tournament that didn’t lack for drama — it was very nearly downgraded to an exhibition event — the Canadians beat the host Swiss on the final day in what seems to have been a decidedly bad-tempered contest. The Canadian view: the plucky Canadians overcame terrible ice and biased refereeing to win 3-0. “We played eight men —“the Swiss players and the referees — and still beat ’em,” Corporal George McFaul, RCAF trainer, crowed after the game. The ice conditions and the refereeing were so bad that at times the game threatened to develop into a farce. The officials, Eric De Marcwicz of Britain and Van Reyshoot of Belgium, were pointedly in favour of Switzerland, some of the latter’s decisions being almost unbelievable. Later, Heinrich Boller, Swiss defenceman, cross-checked Thomas (Red) Hibbard, who fell heavily to the ice. Both players were sent to the penalty box. 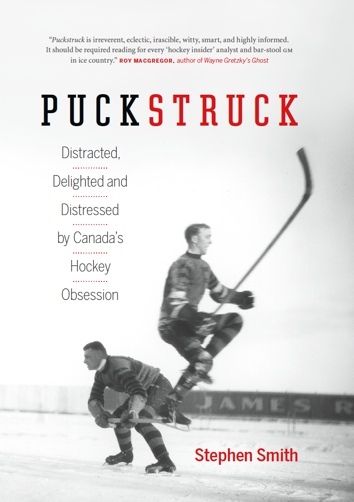 Near the end of the game during a scramble in front of the Canadian goal Boller punched [goaltender Murray] Dowey in the face but was given only a two-minte penalty. During the second and third periods, the partisan Swiss crowd, taking exception to some of the referee’s decisions, hurled snowballs at the Flyers.